Here in Florida, beach running is a main exercise to lose belly fat. However, running to lose fat is a beach workout that needs to be done sensibly and with some safety considerations in mind. 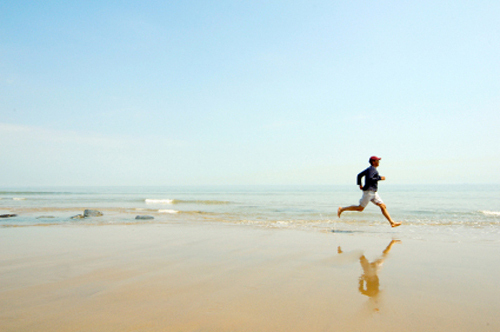 How many times have you heard, "Running on the beach will strengthen your legs like no other workout"? How about, "If you want to see how to burn belly fat, start a running program on the beach"? Or maybe this last one, "You can build huge calves running on sand." The trouble with these quasi-beneficial training bromides is that they contain some element of truth...so, separating fact from myth can become fairly tough. Seeing pictures of Rocky Balboa, the Navy SEALS, and the United States Marines running in beautiful white beach sand only tends to cloud up the picture. Running on the Florida beach is something I do to help burn belly fat, but I do not try to look like one of the lifeguards from the old Baywatch TV show during a beach workout. Sprinting through the waves, may look dynamic and bring visions of the Florida beach alpha-male, but that is not how it works in reality. First, running in sand and ankle deep waves is so exhausting, you could only keep it up for about 40 meters. Secondly, there is no way I would run without shoes. Are you kidding me? Sharp shells, plus the occasional piece of broken beer bottle, poptop tab, or fish hook will ruin your day real quick. Finally, there is the slope of the shoreline and the aspect of hidden holes to worry about when your path is covered with crashing waves. You can bet elite outfits like the SEALS and the Marines do not put their fighting men in situations that will cause time-consuming injuries. Beach workouts with running are well-planned with those units. If safety is primary for top-level groups of fighting men, that should tell you something about how you should think through your own running workouts. Remember, those slow-motion sprints you see on commercials, TV shows, and the movies are NOT reality. * Always wear shoes. They will get wet and clogged with sand, but they'll protect you. * A running workout on the Florida beach will definitely exhaust your legs. Don't plan on running the same distance as you would on the road. When you first start, you might want to run only about 2/3's of the amount of time you would put in on a dry surface. * There is no way you can run at the same fast pace as on forest paths or asphalt. Use your beach running as a recovery time. You'll really have to throttle back your pace, so you might as well enjoy it. * If you must run near the water, make sure you are on the highest point away from the waves. Be constantly vigilant about what is ahead in your path. Plan for the unexpected. You can't just lose yourself in your iPod and the beautiful Florida beach scenery. * Constantly monitor your body. You will be running on uneven surfaces, whether you are up on the sugary white sand or down where the surf has splashed on the shore. Knees and ankles have a tendency to move in a variety of planes. If you start to feel pain...STOP. * Always keep in mind the humidity. Mornings, right about dawn, are the best times to run on the Florida beach. I make sure I bring more water than I think I'll need and leave it in the cooler back at he start. It is good to carry a small hand rag in your waistband to wipe off your face from time to time if you are working out for 20 minutes or more. Beach running is one of the best exercises to lose belly fat. However, you have to be intelligent about planning your beach workout. Running to lose fat is a proven program, just make sure you are being sensible and safe. An injury while doing something fun...is no fun.